Ah, the 1950s. For every American high school senior year student of the era, only one thing really mattered and that was the end of year prom. But, after what was usually a very important rite of passage for the students, as the confetti was swept up and the last decorations were taken down, it was time to face their futures as adults. So, what happens after the prom? Well, that is at the heart of The Marvelous Wonderettes which is receiving its UK premiere at the Upstairs at the Gatehouse Theatre. Springfield High School in 1958 and its prom time. Due to their lead, Billy Ray Patton, being suspended from school for smoking, the Glee club aren’t able to perform at the prom so, thanks to Mr Lee, entertainment is being provided by a group of cheerleaders called The Marvelous Wonderettes. The four girls – Missy (Sophie Camble), Cindy Lou (Rosie Needham), Betty Jean (Louise Young) and Suzy (Kara Taylor Alberts) – are best friends determined to make the most of their time not only to perform but also to lay out their pitch to win the coveted Queen of Dreams (prom queen) title. Whilst all is sweetness and light on the surface, there are tensions beneath the surface. For example, Cindy Lou and Betty Jean may be BFFs but they are also major league rivals, not only for the prom queen title but also for the affection of a young man called Johnny who seems to have no objection spreading his charm between the two girls. As the Wonderettes perform a selection of songs – some with not very subtle messages attached – they get closer to the moment when one of them gets crowned Prom Queen. Jump forward to 1968 and Principal Varney welcomes everyone back to their 10-year reunion, which sees the Marvelous Wonderettes reformed for one night only and once again taking to their old high school stage. How has the last decade treated our fabulous foursome, who are no longer teenage schoolgirls but women in their own right? Two of the greatest musical decades brought together in a full-length musical. You have to hand it to writer/creator Roger Beam for taking this idea and producing a fabulous evening’s entertainment out of some of the most evocative music of the eras. I have to say that I felt the second act was structured slightly better and the songs and narrative felt more connected than in the first act. But that is a minor thing as I loved the whole idea of following on from prom to see how things panned out for the girls 10 years on. And this leads me on to the cast. Four really talented actors/singers/dancers that provided a wonderful insight into the world of high school students and adult women in who the insecurities of adolescence have not necessarily been expunged. Each character was very different but was an integral part of the whole. So Missy was the optimistic peacemaker, Cindy Lou the ‘vamp’ Betsy Jean the clown and Suzy, the slightly insecure one. Sophie Camble, Rosie Needham, Louise Young and Kara Taylor Alberts played their respective roles beautifully. Although I didn’t have a favourite, I have to admire Taylor Alberts’s portrayal of Suzy in Act II which, and no spoilers, really worked well at exploring the character’s transformation from student to woman. The Marvelous Band under MD Lauren Ronan sounded as good as they looked and Iona Holland’s choreography, coupled with Emily Bestow’s costumes, really added to the 50s and 60s feel of the show. Director Joseph Hodges, pulled all the elements together beautifully to provide the audience with a wonderful night of music and emotion under a golden moon. Being a fan of both 50s and 60s songs, there were many musical highlights for me and a couple that really spring to mind are ‘It’s My Party’, ‘You Don’t Own Me’, ‘RESPECT’, oh let’s face it, I could list pretty much all of the thirty plus songs in the show. 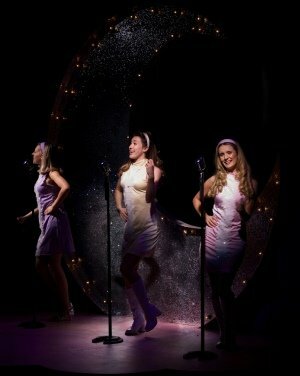 Considering how long The Marvelous Wonderettes has been around, and the number of times it’s been produced in the USA, I was surprised that this was the first time the show was being performed in the UK. Having sat there and, quietly, sung along, while revelling in the story of Missy, Cindy Lou, Betty Jean and Suzy, I have to say I believe it won’t be the last time. After two extensive Off-Broadway runs garnering outstanding critical acclaim, The Marvelous Wonderettes receives its UK Premiere in this glittering new production. The show takes a cotton-candied musical trip down memory lane to the 1958 Springfield High School Prom, where we meet the Wonderettes: four girls with hopes and dreams as big as their crinoline skirts! The show follows their lives and love from Prom Night to their 10-year Reunion. The production is directed by Joseph Hodges with choreography by Iona Holland and musical direction by Lauren Ronan, design by Emily Bestow, lighting design by Sarah Mc Colgan, sound design by Phil Wilson and casting by Jay Gardner.